10 D Volume Flare Lashes, 60 pcs, without knots, C curl, 0.05 mm "thin", wafer thin - also known as "hot melting lashes"
Incredible: one of these of Flares consisting of 10 hair weighs less than one 0.2 mm eyelash! 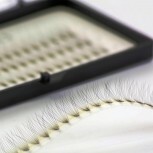 "Eyelashes you want to swoon over"! A known method of processing melt fibres has been employed here, which consists of using heat to fuse together the ends of 10 hair of differing lengths and dispensing with knots to stick them. Besides, some of the 10 little hair are a little shorter. 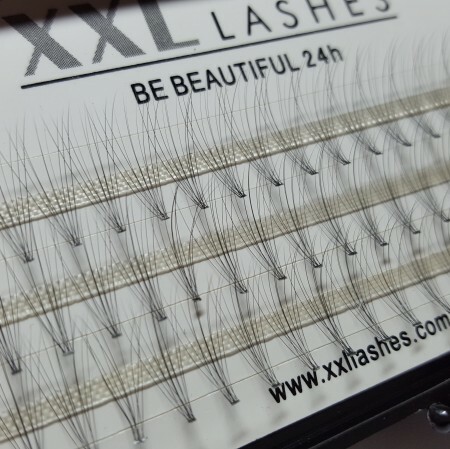 This not only makes them feather weight but lends body and volume to the row of eyelashes. The yellow circle stands for a 0,05 mm size respectively.